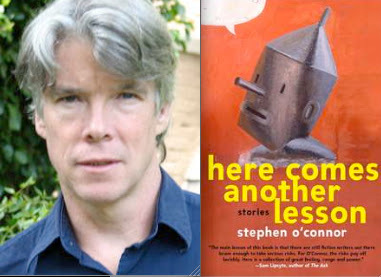 In the 54th in a series of posts on 2010 short story collections entered for The Story Prize, Stephen O'Connor, author of Here Comes Another Lesson (Free Press), discusses his unorthodox approach to writing a story. My favorite way to start a story is to get myself into a jam. I try to sit down at my computer with an utterly blank mind—that is with no idea of what I am going to write. As rapidly as I can, I jot down a sentence that is both surprising (to me, at least) and has some form of narrative potential. Then I try to follow the sentence with another that would seem profoundly incompatible with it, at least in a sane or coherent world. That’s the jam I like to be in, because then my challenge is to make this impossible world seem as natural and real as the world outside my window, and out of that challenge come all sorts of unexpected images and ideas. So there was my jam: How can I make a Minotaur, a Labyrinth, pine paneling and computer games all feel components of the same universe? And, of course, I also had some intriguing narrative challenges to contend with: The Minotaur of myth ate the hapless virgins deposited in his Labyrinth; would this Minotaur eat the new girl? Would she, in fact, turn out to be a virgin? Would that have any significance in their relationship? Once I had these two sentences, the story—“Ziggurat” (the first in my new collection)—began to write itself, which is to say that the challenges comprised by these sentences turned out to be continuously inspiring. As I wrote, however, I tried again and again to get myself into jams, by taking the plot and even individual sentences off in directions I didn’t expect and wasn’t sure how to deal with. I find this sort of writing thrilling in the way that a good jazz solo is thrilling. What I love most in jazz is when the soloist takes the underlying melody all the way to the edge of noise—and maybe even a bit farther—without actually tumbling into cacophonous incoherence. When I listen to such a solo in a club, I am always asking anxiously at every new turn, “Is he going to do it? Is he going to pull this off?” And I feel an almost ecstatic gratitude when the soloist steps back from the edge of noise and gives me a new sort of music I have never imagined before. I want to do something almost identical for myself and for my reader when I write. I want to cross over to a place where my stories and my language seem on the verge of devolving into nonsense and then return with some new way of making sense of this lunatic world and/or our anarchic hearts. That is my hope, at least… But as to whether I am actually capable of fulfilling it—well, that is something I can never know.